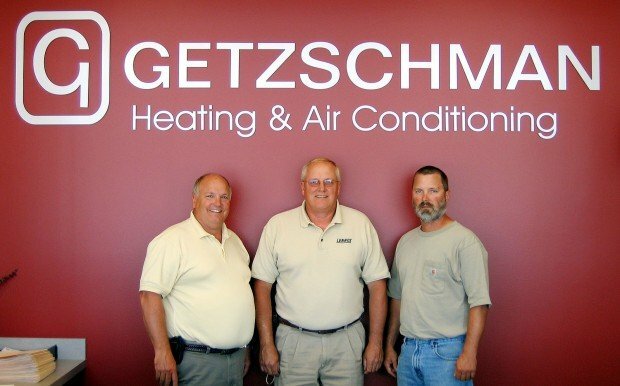 The heating and air conditioning industry has changed in the 50-year history of Getzschman Heating, but Scott Getzschman said the company's success still rests on the pillars established by his parents, Dolores and the late Richard Getzschman. They started the business out of their garage at 1355 Garfield Street. It is now owned by their sons, Scott, Ron and David. "Our company was founded by our parents," Scott Getzschman said. "Their foundation for growth was honesty, integrity, and prompt professional service." The company will accept the 2010 Business of the Year Award for businesses with more than 25 employees during the Chamber of Commerce Awards Luncheon at 11:30 a.m. Wednesday at the Fremont Golf Club. The awards are sponsored by the Fremont Tribune. Chamber Board Chair Diane Mallette said Getzschman Heating and the Getzschman family have extensive involvement in the community. "I greatly appreciate Scott's ability to successfully manage his business while serving as Fremont's mayor," she said. "I've known the Getzschman family for years and have been impressed with their work ethic, and addition of new services and office space to expand their company over the past 50 years," Mallette said. "Very few realize that this company employs nearly 50 people, contributing significantly to Fremont's economy." Scott Getzschman said the award signifies that the business community, through the Chamber, "realizes that honesty, that integrity, and the prompt professional services that Getzschman Heating provides." "We're all very proud of the fact that there are a lot of other business that were in that group that could have been chosen, and we were chosen," he said. The company's focus in 1960 was about 70 percent commercial and included a major project at the Fremont Tribune office. Today about 55 percent of Getzschman's revenue is generated through commercial business. Residential maintenance agreements have become an integral part of the company's stability and growth, accounting for about 20 percent of revenue. The company offers 24-hour service 365 days a year. "We continue to focus on our maintenance agreements for growth," Scott Getzschman said. "Our maintenance agreements are what connect us to our residential business model. 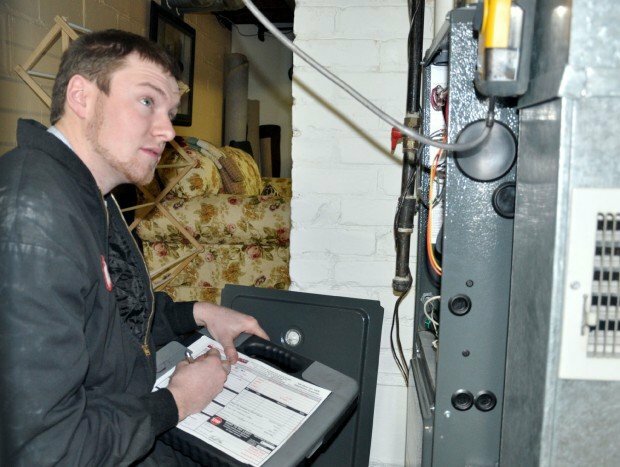 "We have approximately 2,100 agreements and we provide service for both heating and cooling seasons, so we visit the homeowner twice a year," he explained. "We tune their furnaces to ensure that they're as close to factory fresh as possible. That is where our main focus has been throughout 2010, and we'll continue to focus on that through 2011." The maintenance agreements give customers piece of mind, extend the life of heating and cooling units, ensure safety from carbon monoxide leaks and hold down utility costs, he said. Getzschman's also does new construction for custom homes. The main Fremont location at 1700 E. 23rd Ave. N., housing the executive offices, has relocated four times since the company was founded. It moved to its current location in December 2007. The location has an efficient floor plan and offers good visibility at a main entrance to Fremont, Getzschman said. Getzschman Heating was located on North Broad Street, then on Yager Road east of the mall before moving in 1983 to 620 E. 32nd St., now the home of Nye Legacy, where it remained until moving to its current location. Lenox purchased the company in 1997 and owned it until 2004. It still operated as Getzschman Heating during that time, and the Getzschman family bought it back in 2004. Roger Panier came on as a partner at the time. The company has grown from three or four employees during the early years to 47 today. Diversification has added sales and installation of rubber roofing, duct cleaning, and the facility has a full sheet metal shop. Getzschman's also offers clean air filter systems to improve air quality. As the customer base grew, the company added a satellite office in Blair in 1992 for service technicians, and in 2004 opened a sales and parts office in Omaha. Getzschman's hosted a 50th anniversary open house and pancake breakfast in April. Getzschman's community impact can be felt through involvement at Midland University, Metropolitan Community College, the Fremont Family YMCA, Care Corps, Habitat for Humanity, as well as the Chamber of Commerce and other places. "We've always been involved in the Chamber," Scott Getzschman said. "I served on the board back in the mid to late 1980s; that was a great experience." Getzschman Heating provides heating and cooling for at least one or two Habitat for Humanity homes each year.